Verotel celebrates summer by giving all high-risk adult merchants the opportunity to process for an all-inclusive rate of only 5% in the months of May to August. 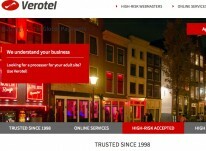 If you process with any other high-risk processor and if you bring Verotel your business Verotel charges only a 5% rate on credit card transaction processing. The merchant that brings the most business is awarded with an all-paid for VIP weekend trip to Amsterdam in September during WebmasterAccess.